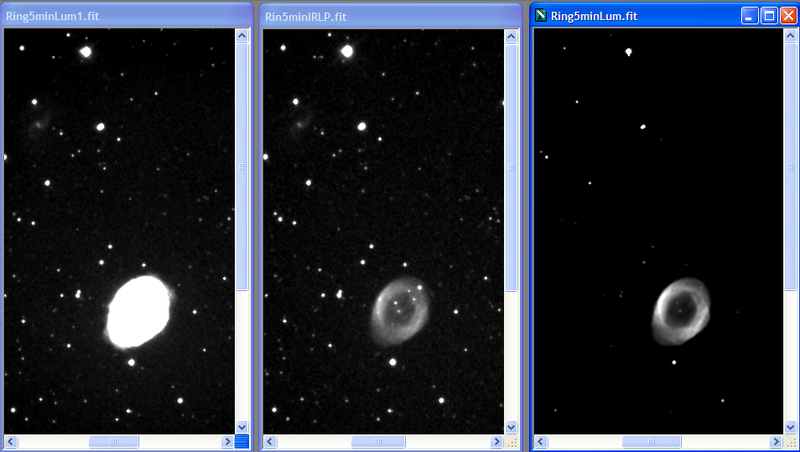 Right image: VIS luminance with NIR blocked stretched to show nebular detail. This interesting comparison shows the popular Ring Nebula in visible (VIS) and near-infrared (NIR) light using Astrodon filters. The VIS luminance is 50% stronger than the NIR luminance due to the QE of this KAF3200ME CCD in the ST10XME camera. The nebula is dominated by strong VIS emissions from hydrogen, nitrogen and oxygen. The SII VIS emission is relatively weak. However, there still is emission present that defines the nebula in the NIR, as shown below. This is likely to arise from strong sulfur (S[III]) emissions in the 900 – 1000 nm reion. S[III] is a forbidden transition like the OIII VIS emissions near 500 nm that give planetary nebula cores their "teal" color, as shown in the color bar. Spectral line assignments are from Rudy et al. Astron. J. 121 362-370 (2001) "The Near Infrared Spectrum of the Planetary Nebula IC 5117. Lastly there are two bright stars toward the 2 o’clock position between the proginator central star and the bright star near the edge of the nebula. They are nearly absent in the VIS image. These are likely to be cool stars in the line-of-site not readily observable in the VIS. This is interesting for LRGB or CRGB imaging. If these stars show up from a clear unblocked luminance (C) image containing both VIS and NIR, there will be no signal coming from the RGB filters to color it in our typical C + RGB layered construction in Photoshop. One the other hand, an LRGB image containing only a VIS luminance (NIR blocked) will not pick these stars up at all.